In 1999, Peter Luzmore founded the highly successful global consulting company Synthesis LLC, which specializes in mobilizing leadership teams to produce increased levels of productivity, satisfaction and value. He is a Certified Master Somatic Coach with Strozzi Institute and has been published in an anthology entitled, “Being Human at Work”. Peter has held various positions in the areas of organizational design and human development. Peter started training people as a workshop designer and leader with Young & Rubican, an advertising agency with offices worldwide. He also has held the position of Director in the Consulting Division of Action Technologies working on strategic accounts for companies such as General Motors and Bankers Trust in Europe and the United States. In 1994 Peter founded Innovative Business Design which specialized in education and consulting in Business Process Redesign. Contact Peter or find out more about Synthesis LLC. Thanks Peter, for taking the time to share your thoughts with us. 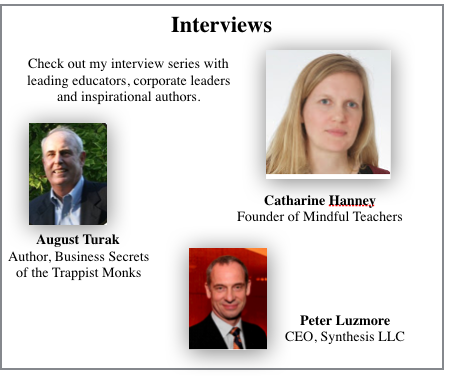 Join me for an interview with August Turak, author of “The Business Secrets of the Trappist Monks”. Augie discusses his spiritual quest, how it led him to Mepkin Abbey, and eventually extraordinary business success. We discuss how selflessness and a total dedication to service can produce both a transformation of being and success in the workplace. His words are especially important for those of us who work in schools on behalf of children. August Turak is a corporate executive, entrepreneur and award winning author who attributes much of his success to living and working alongside the Trappist Monks of Mepkin Abbey for over 17 years as a frequent monastic guest. After a corporate career with companies like MTV, August Turak founded to highly successful software businesses, Raleigh Group International and Elsinore Technologies. In 2000 he sold his companies to an Identify Software and the combined firms were eventually acquired by BMC Software for $150 million. In 2004 Turak won the $100,000 grand prize in the John Templeton Foundation’s Power of Purpose Essay Contest for his essay Brother John. He has been featured in the Wall Street Journal, Fast Company, and the New York Times, and is a popular leadership contributor for Forbes.com and the BBC radio show, Money Matters. Turak lives on a 75 acre cattle farm outside Raleigh, NC. At its heart work is a spiritual endeavor. Educators spend much of our waking lives in the classroom or at school. It’s a place where our values and beliefs are revealed and manifested for no matter how hard we may try to compartmentalize our work lives from our home lives, in truth we have only one life…and one self. August Turak takes us far beyond the typical leadership tips and techniques so common in business books to examine the mysterious inner currents of successful organizations. At the heart of Augie’s book is a deep rooted belief that life, and therefore work, is a spiritual quest, a yearning for transformation. He describes how “transformational organizations” …those that pursue service and selflessness as their main goal, (I would argue that schools should be exemplars of this) reap success as a by-product. By embodying our values and beliefs and pursuing spiritual growth…and selflessness, we can find meaning and professional success. Augie’s premise is insightful and extremely relevant for educators. His amazing life story takes us behind the scenes at Mepkin Abbey, MTV, and his two highly successful software businesses, Raleigh Group International (RGI) and Elsinore Technologies to see how service and selflessness can help one thrive professionally and at the same time bring meaning to our personal lives. I used to prepare for important meetings by writing down the key points I wanted to convey. I’d try to anticipate what people’s responses would be and prepare for those as well. In a sense, I was trying to do as much as I could to ‘script’ the conversation. I did this whether I was planning for a ‘one on one’ or team meeting that I felt was particularly important or potentially emotional. Preparing like this made me feel safer and reduced the prospect of me being surprised. Being unprepared made me feel vulnerable. The problem was that invariably the conversation or meeting would take an unexpected turn. Because I was so locked into my own agenda I’d get thrown off and become clumsy and stiff. I’d do everything I could to bring the meeting back to where I wanted it to go rather than pay attention to what the folks in the meeting were trying to address. Over time, forcing my own agenda on folks and ignoring their concerns eroded my team’s trust in me. There’s nothing wrong with preparing an agenda or being clear about what we want to achieve at meetings; but I was ignoring the deeper, more important part of the meeting; the part of the meeting that was not cognitive; but affective…consequently, my ability to lead effectively was diminished. You see there are things going on at meetings…silent, under the radar things, that are really important…whether we’re aware of them or not. Think back to a meeting you participated in that didn’t go well. What was it that made you feel that way? was so concerned with sticking to the agenda that he cut off some important discussion without resolution. wasn’t really listening to you. seemed to be frustrated with you when you brought up an issue that wasn’t on the agenda. the meeting leader has no agenda and the conversation flails all over the place. there’s no commitment to any action after a long discussion. even when there is a commitment to action there’s no follow up. Whether we’re conscious of it or not, our team is making assessments about us and our leadership even if they never verbalize them. Our team’s mood is affected by how trustworthy we’re perceived to be, our tone, how well we listen, and how we show up as people. Today, I realize there are two parts to every meeting. The overt content that generally dominates our agendas, and the under the radar assessments and mood of the team. I’ve learned to prepare for both parts of the meeting; but with much more emphasis on the silent dynamics. I want the team to develop trust in me and/or the team itself. I want to be open to what others have to say and not allow my personal agenda to close off possibilities. I want to be a good listener. I don’t want to be judgmental. Once I prepare my desired outcomes I spend a few moments preparing myself. If I want to engender trust or be open to others, I prepare by spending a few moments letting go of all my thoughts and plans and do a bit of mindful breathing, or I might engage in a personal practice I have to open my heart. I might reconnect with my life’s purpose, my beliefs, my values, and my commitments. I do my best to feel the goodness in my own core and in so doing feel the goodness of others. …has made me a much more effective leader. I was born and blessed, as are each of us, with a natural curiosity. There was a great wildness in it. As a child I’d see a shaft of sunlight illuminating a world of dust and delicate objects floating in air and I’d stop whatever I was doing and begin to explore this tiny universe. It was magical. I was called to learn. Curiosity was my birthright. It was in my DNA. It’s in yours. My natural curiosity was like a wild animal and it hunted where it needed to in order to satisfy its deep hunger. As a child, I awakened each day with an insatiable appetite to explore, to discover, to learn. In my early years I was a voracious “wolf of learning”. I believe deep in our DNA there’s a relationship between curiosity, learning and survival. We might call it “the burning relevance of an empty stomach”, because in past millennia our ancestors needed to be voracious learners in order to survive. Over the centuries, learning has become institutionalized. Vast school systems and local and national curricula are now the norm. And as these institutions have grown, they’ve pushed aside much of the wildness of our natural curiosity. Looking back I realize that as I worked my way through the educational system I became more tame and more timid. I can see now that in many ways I was being domesticated. I was no longer a “wolf of learning”. How did this happen? To start with I had virtually no control over my education and whatever natural curiosity I had was replaced by a structured and scripted curriculum. I was rewarded for following directions and doing what I was told and reprimanded if I let my curiosity wander too far from the prescribed lesson. I was chewing on someone else’s agenda and not mine so I simply worked in “compliance mode”, putting forth minimum effort. Fear of retribution and bad grades become my prime motivators, not the excitement of discovery and learning. Thus I became a ward of a system that trained me to expect to learn without going on the hunt. Like a domesticated pet I was offered bland processed learning, laid out in prescribed amounts, at certain times of the day. A pre-set curriculum guide that had little to do with me, my interests, my needs, or my gifts, decided what I was fed, how much, and when. I rarely experienced learning by my own wits, my natural curiosity, or even the magic of serendipity. I was no longer the wolf who’d gorge on learning and fight over the scraps until my belly was full. I became so domesticated that I would’ve rebelled if asked to use the natural gifts for learning with which I was born. It would have been like releasing a pet house dog into the wilderness…the odds of survival would’ve been small, and within hours I’d have been back in front of the door begging to have my master serve dinner to me in a dish. Now, rediscovering my own power, wildness, curiosity, and love of learning is my lifetime pursuit. …and answer the “call of the wild”. Catharine Hannay is the creator and editor of MindfulTeachers.org, which focuses on mindfulness, compassion, social-emotional learning, and teacher self-care. Catharine taught ESOL for twenty years, including eighteen months in Osaka, Japan, and a dozen years at Georgetown University’s Center for Language Education and Development in Washington, DC. Catherine is unique in that she is selfless in her approach to helping teachers and students. Instead of promoting herself and her organization, she promotes the work of others who she feels are dedicated to keeping education focused on the well-being of the human beings that teach and learn in classrooms all over the world each day. Her website is a tremendous resource for anyone who is interested in deepening their understanding of mindfulness in education; but more than that it’s a testament to keeping teaching a path with heart. Catharine’s an inspirational educator dedicated to doing the right thing for the right reasons. Enough said. I’m truly excited and honored to have Catharine as my first guest for a series of interviews that I’ll be doing over the next year. Pete: What got you interested in mindfulness in education, and why did you decide to start your website? Catharine: I’ve always loved learning, and I’ve always loved teaching, but I haven’t always loved school, either as a student or a teacher. Instead of an enjoyable exchange of information and ideas, it can feel like we’re caught on a fast-moving treadmill trying to catch flaming torches. Mindfulness provides a way to pause in the midst of the craziness, an alternative to running and juggling faster and faster while feeling like we can never catch up. I’ve found it tremendously helpful and wanted to share what I learned with fellow teachers. Developing MindfulTeachers.org has been an amazing experience. I’ve been contacted by readers not only from the U.S. and Canada, but also from England, Ireland, Scotland, Australia, South Africa, Romania, and Zambia. I’ve discovered that teachers and students all over the world face similar challenges, and the same basic mindfulness practices can benefit people of any age and any culture. Pete: Teachers are facing many challenges: higher standards, growing workloads, a never ending stream of mandates, new technology, changing demographics, and increased resource scarcity, to name a few. What advice would you give to a teacher who is becoming discouraged, or is just plain stressed out and tired? Catharine: 1. Don’t throw good time after bad. If you participate in a frustrating hour-long meeting, then vent about it for half an hour with one of your colleagues, then stew about it for half an hour on your commute home, then vent to your spouse about it for an hour over dinner, then spend the rest of the evening stewing about it again… You’ve just turned a frustrating hour-long experience into a frustrating 5- or 6-hour experience. You probably can’t avoid the meeting, but you can choose not to let it ruin the rest of your day. 2. Take a lunch break. I know too many teachers who work straight through the lunch period without eating anything, and are ready to fall over by 3 pm. Even on the craziest days, you can find five minutes to eat half a sandwich at lunch time, then another five minutes to eat the rest of your sandwich after school. This is also a good way to fit in a quick mindfulness practice; while eating, just eat. Taking a few minutes to clear your head will help you better focus on whatever comes next. No work. No texts. No phone calls. No internet or TV. At least half an hour a day, and at least half a day a week. Even (especially) at the busiest times of the year. 4. Practice compassion, toward others and toward yourself. Everyone’s under a tremendous amount of pressure; be as kind as possible toward your students and your colleagues, and don’t be too hard on yourself if you don’t always live up to your ideals. Of course you should always do your best, but your best is never going to be perfect. Don’t blame yourself for factors you can’t control. Pete: Teachers do so much of their work in isolation. Some are so busy that they eat lunch in their rooms and rarely see their colleagues. How do you feel about teachers banding together to break through this isolation and support each other? Catharine: Well, following up on the last question, kudos for eating lunch. And don’t feel bad about occasionally needing some time alone. After spending the whole day in a room full of students, you may be required to participate in faculty meetings, professional development sessions, field trips, coaching, or parent-teacher conferences. It can be exhausting to be “on” all the time, and having a bit of solitude in the middle of the day can help you recharge. That said, there are enormous benefits to making connections with colleagues. At Georgetown, I participated in a “language teaching circle.” The Arabic professors helped me understand the linguistic and cultural background of my Saudi and Emirati students. I learned about great new activities from professors of Chinese, Italian, and Catalan. And observing a discussion among some of the French instructors made me rethink how I teach American culture: especially in a country with so many immigrants, when we talk about what “we” do in “our” country, who’s included in “we”? It doesn’t need to be anything formal. Is there someone you could have lunch with once a week, or even once a month? Could you chat for a few minutes after your last class of the day? You never know where this could lead: it’s how I got to know some of my closest friends, not to mention my husband! Of course, not everyone’s going to become your best buddy (or spouse), but these types of informal exchanges are a great way to let off steam, brainstorm how to deal with challenges, and learn about new materials and activities. Don’t be afraid to take the initiative, and don’t be offended if someone turns you down—everyone else is extremely busy, too. Just try again with someone else. There are probably several people at your school who would welcome a chance to chat and share ideas. Pete: In your experience, what role does the ‘self’ of the teacher play in the success of their students, and how is this connected to mindfulness? Catharine: To a certain extent, bringing our ‘selves’ into the classroom is a matter of becoming more conscious of something that happens automatically. We all have preferences and interests and a unique take on the world, and that can’t help but seep into our teaching. Of course, this doesn’t mean we just let it all hang out. There’s a lot of personal information that isn’t appropriate to share with our students, and we have concerns they can’t necessarily relate to, especially if they’re much younger than we are. It’s important to make choices about how open to be, based on what’s most beneficial to a particular group of students. Mindfulness helps us stay calm and present to whatever is happening right now, rather than getting caught up in projections about what might or should be happening. This enables us to bring our best selves into the classroom, which can only benefit our students. Pete: What professional development programs or other resources do you know of that focus on cultivating the ‘self’ of the teacher? There are also some great books on contemplative teaching and bringing our authentic selves into the classroom. In addition to your book A Path with Heart, I’d recommend Teaching: The Sacred Art by Rev. Jane E. Vennard, and The Courage to Teach by Dr. Parker J. Palmer. I have reviews of these books at www.mindfulteachers.org/p/recommended-books.html. Your readers might also be interested in the mindfulness activities for students and teachers (http://www.mindfulteachers.org/p/free-resources-and-lesson-plans.html), as well as the resources on teacher self-care (http://www.mindfulteachers.org/p/mindful-but-busy-teachers.html). It’s important for teachers to remember that taking care of ourselves isn’t self-indulgent. It’s a conscious strategy to become calmer and more energetic so we can better meet the needs of our students. Recently I was privileged to lead a group of roughly twenty five teachers and “teachers to be” at regional conference. The title of the workshop was, “Taking a Road Less Traveled: Increasing Learning and Literacy”. The premise behind “The Road Less Traveled” was that student learning can be improved by diverging from the usual path of content and pedagogy based PD. The road I wanted to explore with these educators was the rarely traveled “path of the heart”. In my experience, it’s the power of the teacher’s heart that’s central in building relationships and developing trust with students, as well as being the wellspring of inspiration, support, and motivation. There’s ample research to support the fact that classrooms with the most positive teacher-student relationships and the deepest levels of trust yield the greatest academic results, and, as a by product, produce greater levels of student social and emotional growth. The crucial role of relationships and trust, and the role the heart plays in their development, seems to be one of the best kept secrets in education these days. It is indeed, “The Road Less Traveled”. I began my session by asking folks how they would describe the heart in education. The first hands that went up spoke of purpose, passion, caring, and kindness. It was clear to everyone in the group that each of these elements of the heart were fundamental to effective teaching. But what other important characteristics inhabited the realm of the teacher’s heart? There was silence. After they were done, I explained that the word courage derives from the French word “cour” or heart. When you have courage you have heart. This element of the heart, courage, was the first territory on the road less traveled that I wanted to explore with them. I asked, “What about risk taking?” Courage. Lifelong learning? Wow! Real courage! Especially if it’s transformative learning and not just stuffing our head with more content and pedagogy. Why? Because learning something new makes us beginners. Learning something new is like walking into a railroad tunnel in the side of a mountain. As we enter we have the full light of day behind us. We can see where we’re going. As we get further and further into the tunnel the light behind us gets fainter and fainter until at some point it fades completely and we find ourselves standing in the dark, not able to see the light ahead of us or behind us. In the dark, unable to see where we are going, we courageously take a step forward, then another, and another. If we trust ourselves, if we keep our heart strong, eventually, off in the distance, we see a pinprick of light and walk toward it. When we exit the tunnel on the other side, we find that we aren’t the same person who entered it. The teacher’s heart is rock solid and truly courageous. Whenever I hear cynics misrepresenting the power of the heart, I close my eyes and remember Dawn Hochsprung, Mary Sherlack, Lauren Rousseau, Rachel D’Avino, Victoria Leigh Soto, and Ann Marie Murphy, the educators at Sandy Hook that gave their lives protecting their students from a deranged gunman. The odds are that during our career we’ll encounter students who are the children of alcoholic or drug addicted parents, students who have been physically or mentally abused, or bullied cruelly. They may have been victims of incessant and violent spousal clashes or angry divorce and custody disputes. They may experience the loss of a family member, a debilitating illness, or a variety of physical challenges. Students who have experienced these types of trauma may have a diminished sense of self. They may feel so fragile that they build and hide behind psychological walls to survive. They may be uncomfortable with intimacy, find it difficult to form relationships, and hide their feelings of inadequacy behind a mask of indifference. Some students may be angry and set out to punish others by hurting themselves. “See what you’ve done to me! You caused this. Aren’t you sorry!” Others who’ve lost their sense of worth may engage in destructive behavior, “I’m no good, and I’ll prove it to you.” or “What’s the use of trying,?” Those that feel powerless may assert their power where they feel they can, “You can’t make me do it!”. Some will try to gain what they feel they lack by becoming the center of attention, “Pay attention to me! I need your approval!” Others may simply perpetuate the cycle of abuse in which they are caught by abusing others. Teaching is difficult under the best of conditions, teaching students who are suffering such inner pain is perhaps our greatest challenge. Let me begin the discussion by being clear that whenever we encounter a student in distress it’s our obligation as educators to make sure that we report it to the appropriate professionals whether that be a school psychologist, guidance counselor, social worker, school nurse, principal, or whoever makes sense in our particular situation. Doing this should be our number one priority. Can we find a better way, a more positive way, for the student who feels powerless to assert their power? Are we centered and present enough to avoid directly confronting their negative assertions? What about the “attention grabber’? How can we work with the ‘self’ that says I need others to validate me? And the abused who becomes the abuser? We aren’t psychologists or social workers but we’re teachers tasked with teaching every student in our classrooms. In order to do that there is some element of the healer that is part of our work. A true healer takes time to gain a deep understanding of the person in distress. They look beneath the outward manifestations of the distress…the destructive behaviors. They see the wound. They remain aware of the wound when interacting with the person. This leads to less enabling and more healing. Is it possible to teach children with bruised and wounded souls in our classrooms without embracing, at least partially, the role of healer? It’s a difficult question and I can’t say there are any easy answers. I’d be interested in hearing your approach to the traumatized student(s) you’ve met along the way.